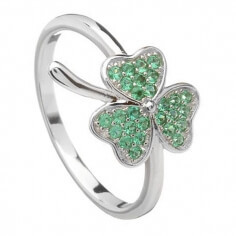 Beautiful curves are the first thing to notice with this Shamrock ring. 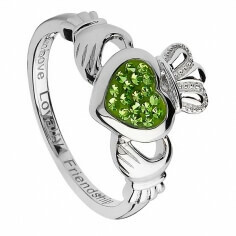 Half of each leaf is lined with emerald green cubic zirconia, giving this ring a distinctly Irish feel. Handcrafted from the finest Sterling silver by highly skilled craftsmen. This ring comes with its own luxury presentation box.